Three full television / video sets, and over 45,000 sq. feet of media production facilities. 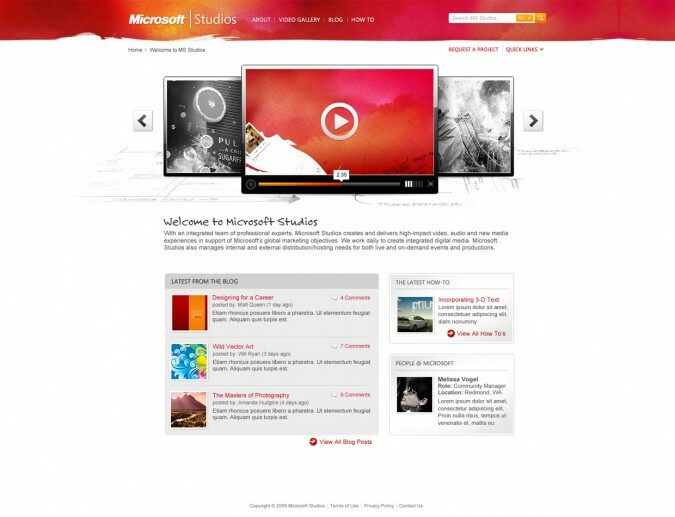 Microsoft Studios is the place to create high-impact video, audio, and new media experiences in support of Microsoft’s global marketing initiatives. Challenge: Create a web portal showcasing the impressive media created at Studios while also facilitating easy searching and cataloging of thousands of videos. Also involved was creating a knowledge base (including blogs, wiki’s and robust search features) for those interested in DIY filming, editing and creation. Solution: The site and associated properties were structured for maximum visual impact, while also being functionally superior from a usability standpoint. Result: With the combined forces of Studios and the project team, we were able to develop a beautiful video showcase portal integrating the latest social media features.